Hosting space is determined by the hosting plan which dictates where the hosting space is located (on which server) and how many allocated resources it has (hosting plan quotas). There might be more than one hosting space under user account. System hosting space is a root hosting space under which all other spaces are created. It can't be changed or deleted and it belongs to serveradmin account. The list of hosting spaces of some user can be seen either on user account home page or by clicking Account > Spaces in the menu. 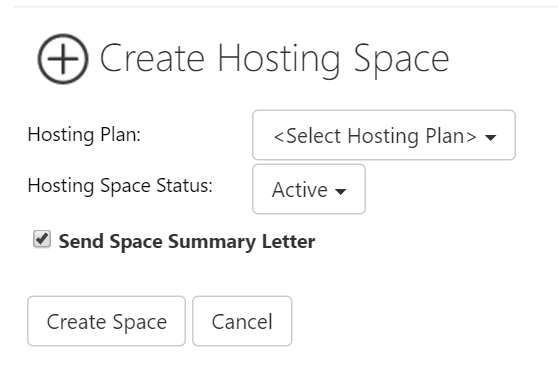 Specify Space Status (Active by default), choose whether to Send Space Summary Letter, choose if you want to Create Space Resources (domain name) and choose if you want Hosted Organization to be provisioned during space creation. Then click Create Space button to finish the wizard.